For the romantic comedy film, see Horseshoe Theory. For the mathematical term, see horseshoe map. 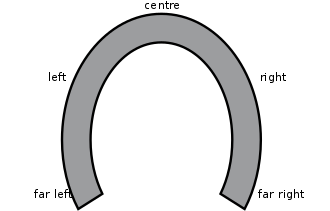 The horse shoe metaphor was used as early as during the Weimar Republic to describe the ideology of the Black Front. Later use of the term in political theory is seen in Jean-Pierre Faye's 2002 book Le Siècle des idéologies. Others have attributed the theory as having come from the American sociologists Seymour Martin Lipset and Daniel Bell, and the Pluralist school. In a 2006 book, political scientist Jeff Taylor wrote: "It may be more useful to think of the Left and the Right as two components of populism, with elitism residing in the Center. The political spectrum may be linear, but it is not a straight line. It is shaped like a horseshoe". In 2006, the term was used when discussing an alleged resurgent hostility towards Jews and new antisemitism from both the far-left and the far-right. Will globalization survive the gloom? The creeping revolt against globalization actually preceded the Crash of '08. Everywhere in the West, populism began to show its angry face at mid-decade. The two most dramatic instances were Germany and Austria, where populist parties scored big with a message of isolationism, protectionism and redistribution. In Germany, it was left-wing populism ("Die Linke"); in Austria it was a bunch of right-wing parties that garnered almost 30% in the 2008 election. Left and right together illustrated once more the "horseshoe" theory of modern politics: As the iron is bent backward, the two extremes almost touch. As the political horseshoe theory attributed to Jean-Pierre Faye highlights, if we travel far-left enough, we find the very same sneering, nasty and reckless bully-boy tactics used by the far-right. The two extremes of the political spectrum end up meeting like a horseshoe, at the top, which to my mind symbolizes totalitarian control from above. In their quest for ideological purity, Stalin and Hitler had more in common than modern neo-Nazis and far-left agitators would care to admit. The horseshoe theory has been criticized not just by people on both ends of the political spectrum who oppose being grouped with those they consider to be their polar opposites, but also by those who see horseshoe theory as oversimplifying political ideologies and as ignoring fundamental differences between them. Choat also argues that although proponents of the horseshoe theory may cite examples of alleged history of collusion between fascists and communists, those on the far-left usually oppose the rise of far-right or fascist regimes in their countries. Instead, he argues that it has been centrists who have supported far-right and fascist regimes that they prefer in power over socialist ones. Horseshoe Theory is the title of a 2017 romantic comedy short film by Jonathan Daniel Brown in which an Islamic State jihadist and a white supremacist meet following a weapons deal over the internet and fall in love after discovering how much they have in common. ^ Mayer, Nonna (2011). "Why extremes don't mee: Le Pen and Besancenot Voters in the 2007 Presidential Election". French Politics, Culture & Society. 29 (3): 101-120. A commonly received idea, one strengthened by the post-war debates about the nature of totalitarianism, is that “extremes meet.” Rather than a straight line between the Left and Right poles, the political spectrum would look more like a circle, or a “horseshoe,” a metaphor the philosopher Jean-Pierre Faye used to describe the position of German parties in 1932, from the Nazis to the Communists. ^ Encel, Frédéric; Thual, François (2004-11-13). "United States-Israel: A friendship that needs to be demystified". Le Figaro. Paris. Archived from the original on 2007-09-30. Retrieved 2009-02-13. Jean-Pierre Faye's famous horseshoe theory (according to which extremes meet) finds verification here more than in other places, and the two states of delirium often mingle and meet, unfortunately spreading beyond these extremist circles. But contrary to the legend deliberately maintained and/or the commonplace believed in good faith, Israel and the United States have not always been allies; on several occasions their relations have even been strained. ^ Filipović, Miroslava; Đorić, Marija (2010). "The Left or the Right : Old Paradigms and New Governments". Serbian Political Thought. 2 (1–2): 121–144. ^ a b Berlet, Chip; Lyons, Matthew N. Right-Wing Populism in America: Too Close for Comfort. New York: Guilford Press. p. 342. ^ Pavlopoulos, Vassilis (2014). "Politics, economics, and the far right in Europe: a social psychological perspective". The Challenge of the Extreme Right in Europe: Past, Present, Future. Birkbeck, University of London, 20 March 2014. ^ Backes, Uwe (1989). Politischer Extremismus in demokratischen Verfassungsstaaten [Political Extremism in Democratic Constitutional States] (in German). Wiesbaden: Springer. p. 251-252. ISBN 978-3-531-11946-5. ^ "Le Siècle des idéologies". Pocket. 2008-12-22. ^ Staff (ndg). "Challenging Centrist/Extremist Theory". Political Research Associates. ^ Taylor, Jeff (2006), Where Did the Party Go? (University of Missouri Press), p. 118. ^ Fleischer, Tzvi (31 October 2006). "The Political Horseshoe again". Australia/Israel Review. AIJAC. Archived from the original on 16 May 2011. Retrieved 27 March 2015. I think Mr. Loewenstein has done a good job demonstrating why many people believe, as the "political horseshoe" theory states, that there is a lot more common ground between the far left, where Loewenstein dwells politically, and the far right views of someone like Betty Luks than people on the left would care to admit. ^ "Josef Joffe Distinguished Visiting Fellow". ^ "New Year's Essay 2009". Roland Berger Strategy Consultants. 2008-12-22. Archived from the original on 2009-02-03. ^ a b "The left's witchunt against Muslims". The Daily Beast. 2015-12-14. ^ "How Right is the Left?". Eurozine. 2018-05-15. This page was last edited on 12 March 2019, at 11:32 (UTC).